where n = years of record and m = rank magnitude of that flood. The largest event is scored as m = 1. Figure 2.11 illustrates flood-frequency curves for Sycamore Creek, Arizona, which experiences irregular flash floods, and for the upper reaches of the Colorado River, with a highly repeatable, snowmelt-driven flow regime. The recurrence interval for floods of a given magnitude is read directly from the graph. One can also determine the likelihood (1/T) that the annual maximum flood for a given year will equal or exceed the value of a 10-year, 20-year, or 50-year flood event. Flood-frequency analysis can also be used to estimate the flood magnitude that has a 1- to 2-year recurrence. 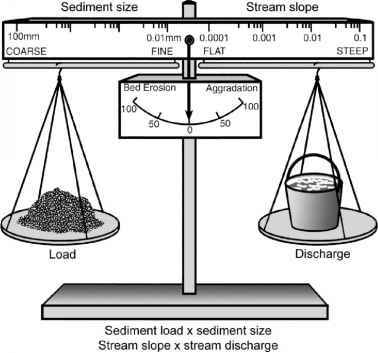 This is often considered to be an estimate of the flood that just overtops the banks, the bankfull discharge (Qbkf ), which in turn is a surrogate for the effective discharge, the flow that is considered most influential in maintaining channel form (discussed further in Chapter 3). Estimating the likelihood of rare events obviously is risky, and becomes more so when only a short hydrologic record is available for analysis. In addition to the possibility that any given string of years can include an individual flood whose true recurrence interval is actually much longer than the record, changes in land use or climate can result in a heterogeneous data set. For instance, the flood-frequency curves for a river before and after construction of a major dam, large-scale deforestation, or urbanization likely will be very different. FIGURE 2.11 Example of a flood-frequency analysis for two rivers, based on annual peak instantaneous flows from a 20-plus year gauge record. 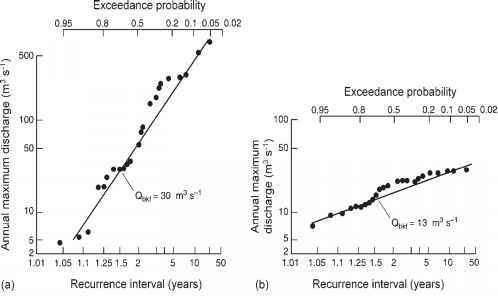 The bankfull flood (Qbkf) is estimated using T = 1.5 years, and the probability or recurrence interval for more extreme events (e.g., 20- and 50-year floods) can be read from the graph. Lines are fitted by eye. (a) Sycamore Creek, Arizona, is an arid land stream subject to flash floods. (b) The Colorado River in its upper reaches, near Grand Lake, Colorado, has a highly regular snowmelt-driven hydrograph. Note the steeper slope of the graph for Sycamore Creek. Brook. Where agriculture replaces forest with crops, it tends to increase average flow, dry-season flow, and peak flows for smaller floods but has little effect on larger floods (Dingman 2002). Development of drainage systems, such as tiles buried beneath the soil surface, and channel deepening and straightening for flow conveyance, have the further effects of speeding subsurface flows and downstream routing of a rain event. Conversion of wetlands into agricultural usage may also contribute to river flooding, since wetlands naturally are locations of surface storage and frequently of groundwater recharge as well. Urbanization can have a very strong influence on streamflows (Dingman 2002). Replacement of vegetation with pavement and buildings reduces transpiration and infiltration, and these impervious surfaces substantially increase the amount of runoff that travels by rapid overland flow. Storm sewers and roadways transport water quickly, and so may require the construction of retention ponds in an effort to retard the flood peak. Runoff approximately doubles when impervious surface area is 10-20% of catchment area and triples at 35-50% impervious surface area (Arnold and Gibbons 1996) (Figure 2.12). Flood peaks increase, time to peak shortens, and the peak becomes narrower (Paul and Meyer 2001). Because a greater fraction of the water is exported as runoff, less recharge of ground-water occurs, and so base flows are reduced as well.